The art of telling stories via dance is an imprecise one. In classical ballet there are usually familiar stories supported by emotional music and a set repertoire of gestures with which choreographers communicate different passions and essential plot developments. In modern dance, most eschew story for abstraction – and even a man of Graeme Murphy's experience at the Sydney Dance Company was more successful, in my view, at abstract works than narrative. Aboriginal dance is inherently ceremonial, with the repetitious words of the songman to guide both dancers and audience. The imitation of animal movements in public dances and the impersonation of figures from myth in more sacred ceremonial would be ritualised and familiar to their respective audiences. So, to expect three relatively inexperienced Indigenous choreographers to master the nuances of their artform would be optimistic. 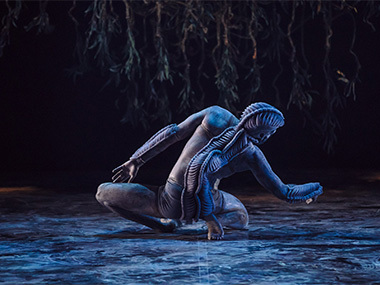 But, with boss-man Stephen Page's guidance, three different dance geographies emerged from the night around a single set motif by Jacob Nash – which served each one with subtle variations. For Djakapurra Munyarryun's work, 'Ngathu' (the cycad nut in Yolngu) – the first choreography by this long-term cultural adviser from NE Arnhemland, this master songman and light-footed dancer – Nash's giant string sculpture spoke to me of the string games played by the Yolngu, who claim more varieties of pattern than Heinz soups! The rituals around the collection, sorting, treating and heating of the cycad before it can be eaten were certainly there in Munyarryun's mind as he shaped this piece – but the important matter that came across to me was its seasonality; as the rains begin to fall, the cycad is one of the few resources that are going to take Yolngu through to the dry, for little movement is possible during that sodden time. It was no surprise that dance movements were repetitious, that men and women divided and failed to engage with each other, and that Djakapurra's amazing chanting voice held the stage when the dance lost interest. It was a surprise, though that the dancers' leg movements tended to be upward lifting rather than earth-falling and ground-shaking, as Munyarryun's certainly are every time I've watched him. Could Matt Cox's lighting design have suggested a bark texture across the floor as the cast danced? Magically, Jacob Nash's sculpture became a desert oak tree for Kaine Sultan-Babij's piece, 'Place'. At the after-party, Stephen Page revealed that behind the choreographer's thinking here was his personal history of growing up gay in an unappreciative community, and there was a lot of movement by temporary fences to suggest the barriers he'd had to overcome. I guess that at the time, though, my reading was more about the tensions in a town like Alice between urban pressures and the surrounding, myth-laden countryside – especially the role of the Caterpillar, the Yeperenye represented by the Macdonnell Ranges that seem determined to crush the town as they crawl towards it across the red dirt. One of the major sections in this work was called 'Caterpillar', and Jennifer Irwin's costumes suggested the sloughed off skins of some creepy-crawly. But then the fine solo section for Leonard Mickelo, engaging with one of the fence sections, could certainly have referenced the intended gay theme. Then again, an earlier duo for Tyrel Dulvarie and Yolanda Lowatta – both graduates of the Russell Page Graduate Program offering vital training and development at the beginning of their careers – offered the strongest emotional engagement of the heterosexual kind of the night. And in Lowatta, a star has been found – every move of her's is pure dance and her Easter Island profile locks in her distinctiveness. 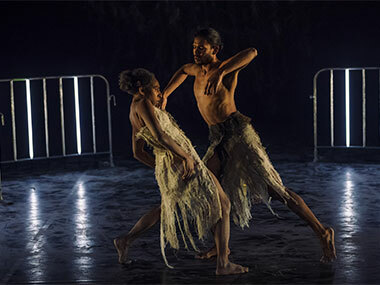 Elma Kris, working with Nicola Sabatino, is an older hand than the others at choreography based on her Torres Strait Island heritage. I love the traditional stuff from the Strait – big women banging big drums hard, and literalistic teamwork by dancers illustrating nautical and piscatorian stories. 'Whistler' was still fishy, but more subtle as we learnt a little of the dugong and its feeding, mating and birthing habits. Suddenly, the Nash sculpture had become a ghost-net – the discarded waste of commercial fishing that pollutes the seas and often entangles sea-creatures; though I really didn't sense this in the politics of a dance section called 'Ghost Net'. The dugong is the ruminant of the sea – a placid and unlovely lump that almost seems to will its own capture to supply essential fish-oils to the Islanders, and Steve Francis's Aarvo Partish music captured this heroic indolence well. But it's not perhaps an ideal subject for dynamic dance! At one point I discerned a dugong hop, which seemed way out of character. The mating dance made more sense, and the choreographers wisely combined traditional drumming and the supposed dugong whistling sound to make for a jolly ending.